No, this doesn’t make you irresponsible, careless or a quitter. The reality is that it happens to the majority of us. We tend to get so wrapped up in setting up such an elaborated plan that one month into it and we just can’t keep up with it. And so you abandon the plan and keep going about your life until December is here again. It’s a shame, really. It was such a good plan. It’s often believed that complexity translates into genius or sophistication. But as one of my favorite quote states, the opposite is actually true. So, this means that in order to have a solid financial plan that we can actually commit to for the long-term, it’s best to take a step back and simplify things. Trust me, finances are already complicated enough; you’ll want to keep it simple. Practice smart banking and budgeting. Get acquainted with the latest banking technology. Tools like bill pay, automatic payments, remote deposit capture (RDC) and automatic budgeting were designed to simplify your life so don’t be afraid to give them a try. Keep track of your spending with mobile banking tools like Refundo, which helps you keep track of your expenses by giving you a detailed view of your transactions with automatic categorization. When it comes to budgeting, you can utilize tools like Manilla and mint.com to get a clear picture of your bills and monthly expenses. This will help you get financially organized in this ever evolving and advancing technological world. If you are paying even or minimum monthly payments on all your existing credit card debt, you are not only wasting money on finance charges, but you are also wasting your time. If you let the bill with the highest interest rate accumulate, you’ll end up paying that credit card bill for life. Pay off highest interest debt first while making smaller payments on the rest. Continue this process until you finish paying them all. When it comes to savings, something is better than nothing. Building your savings, the most important piece of the puzzle, but also the hardest one. We’ve all heard about the “saving for a rainy day” rule of thumb. According to experts, you’re supposed to have three to six months of your income saved. Which I personally think is the exact same reason why many don’t have it. Six months? That’s a lot of savings. Such high expectations can make it intimidating and even discouraging to start saving. So I say stop worrying about the rules and build a savings plan tailored to your lifestyle. Start with a small savings goal. 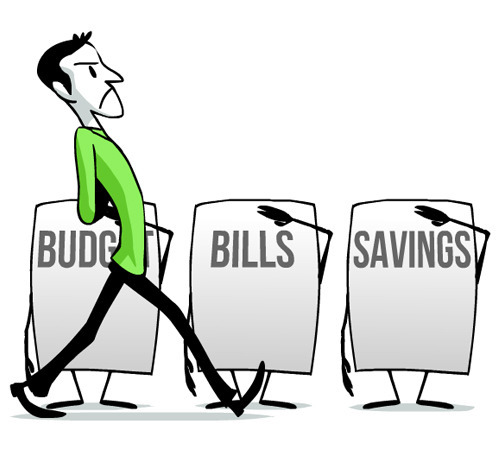 After reviewing your expenses, choose a comfortable sum to set aside monthly and gradually increase it over time. The truth is that we have become a “nation of consumers”. Most people in the U.S., regardless of their income level, don’t have a third let alone half of their annual income saved. So if you are having difficulty starting, here are some ways to find extra cash throughout the month to get the ball rolling. Look at that. Turns out you didn’t need that big old list of resolutions after all. The decision to start and commitment is all it takes. Does your financial future matter to you? So, will you start with small but smart goals and stick to them until you get your finances in order? Of course you will! Because if you do, then without even noticing, that recommended three-to-six-month savings fund will look tiny compared to what you’ve saved.